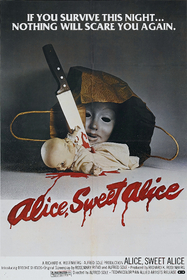 Directed by Alfred Sole, Alice, Sweet Alice (originally titled Communion, also known as Holy Terror) explores the horror lurking behind the Catholic church in a small New Jersey community. Little Alice Spages (Paula Sheppard) is jealous of her younger sister Karen (a very young Brooke Shields). Karen gets the pretty dress, Karen gets the pretty cross necklace, and Mom definitely prefers Karen the best. So, it's only natural that when the precocious sibling is brutally murdered before her first communion, suspicion falls on Alice. Of course, we horror fans know better. The first suspect is the worst suspect. Or is it? The interesting thing about the first half of Alice, Sweet Alice is the game that Sole plays with us. His direction seems to indicate a red herring, but his script (co-written with Rosemary Ritvo) paints an increasingly clear picture of a very unhinged child. It's a bit of a shame, then, that just over an a hour in, the film jumps tracks and turns into an indictment of religious zealotry. Sure, it captures the brain for a bit, but it's just a little too much thematic digression for my tastes. For those who are interested, the killings are certainly shocking. It's not often that you get to see a child murdered on-screen (not that I'm encouraging the practice to any great length), and it's done with some taste here. However, everything else just gushes blood, especially the final, nerve-rattling murder. 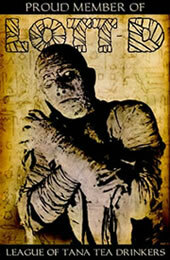 It's a risk to hinge any film, particularly a horror movie, on the performance of a youngster. Few have succeeded (The Sixth Sense), most have failed (The Good Son). Alice, Sweet Alice falls in the middle. Sheppard does well with the preteen angst bits - she exceeds at sullen emoting. She just can't pull off creepy...it doesn't work. All of the rest of the actors met up with the standards of low-budget 70s filmmaking. Nobody particularly stands out, except for Father Tom, sympathetically portrayed by Rudolph Willrich. Oh, and Shields is awful. Perhaps it was a portent of things to come. The out-of-print Anchor Bay DVD comes complete with a director's commentary by Sole and his editor, Edward Salier. Check it out, if you like. It's an enjoyable flick. Cited by many critics as the closest thing to an American giallo film. Interestingly enough, director Sole's cousin Dante Tomaselli would go on to make Desecration, which is as close to Argento's splashy anti-logic period as an American film has gotten. Submitted by matthew (not verified) on Mon, 2010-10-25 11:47. Nate, you need to post some photos of your collection and/or "nerd den". I am sure you have been able to accumulate way more cool memorobilia and autographs than I. Just watched this the other day before work, damn creepy movie. Normally the "trick" endings don't hold up for repeat viewings, but I've always stood by this one. Great reveiw, man! Submitted by Nate Yapp on Mon, 2010-10-25 14:57. Maybe when I get moved into my new place in Los Angeles (once I find a new place in Los Angeles), I'll post some pictures of some of my memorabilia. Submitted by Anonymous (not verified) on Wed, 2011-01-12 02:04. Hi I was actually in the film Alice Sweet Alice as a child...I was one of the children taking communion....also I did some body part shots for Brooke Shields. My Father (My real Dad is Patrick Gorman) he plays (as funny as it is) Father Pat. It was alot of fun to shoot the film definately a memory for a child at the age of 9. I was so surprised to see how much is out there regarding the film. Submitted by emily (not verified) on Mon, 2012-02-13 12:47. I just watched the film and had some questions about it.. Do we ever know who actually killed Alice? Was Karen's spirit really among them? And why does the movie end with Alice saving the knife used to kill Father Tom and looking into the camera? And does the lady who killed father Tom dress up in the comunion dress to look like Alice? Thanks!